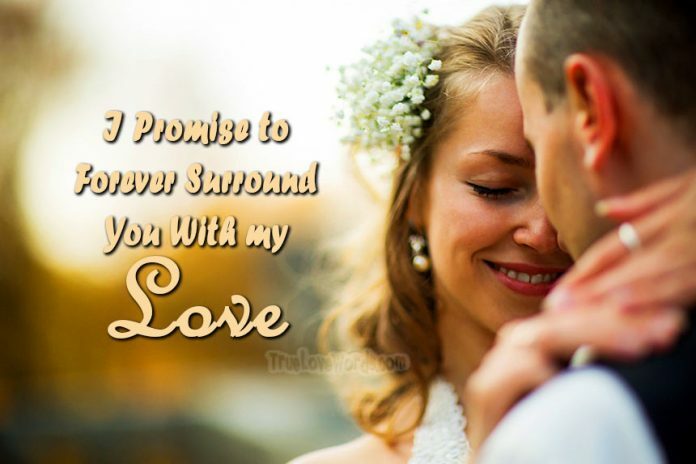 Make your wedding vows for her as unique as she is. Make sincere promises for your marriage that you will honor and keep. Make your wife and partner in life proud. ℘ Meeting you was the best day of my life. Until today. Today begins a beautiful journey, inspired by love, fueled by love, and persevering in love. And honestly, it doesn’t matter as long as you, my amazing bride, are by my side. I promise to love you each step of the way. bringing the gift of His holy love to each day of our marriage. ℘ My beloved bride, I have adored and loved you since I have known you. You are everything to me. Your spirit captivates me. The beauty of your face can never outshine the beauty of your soul. There will never be a time that I will love you less than I do at this moment. I am honored to become your husband. giving you all of me as we walk hand in hand wherever life leads. I promise to dream with you, dance with you, and even decorate with you. I will defend and protect you and give you the desires of your heart all the days of my life. I am overjoyed to become your husband today. I will forever surround you with my love. I have your back, and I will always stay be your side. Your dreams and desires will remain front and center to me. with the most beautiful woman in the world, pledging my love to you. It is an honor to be the husband of someone as kindhearted and amazing as you. reminding you every moment that you are worth everything to me. ℘ We did not choose love, but love chose us. It crept into our hearts slowly, beginning on the day we met, warming us to each other. And as we spent time together, love showed us the joy of knowing each other. as we step into whatever the future holds for us. Today, I choose you to be my wife forever. I want you to know that anything I possess, I promise to give to you all the days of our marriage. From this moment, I promise to give you everything. ℘ You take my breath away, and my heart still skips a beat each time I see you. You are the love of my life, and the life in my love. your light in the dark, and your wings when you want to fly high. I will be the husband you deserve. I can never love you more than in this moment. ℘ One day love walked through my door in the form of a beautiful woman. Love didn’t pound on the door, but it made my heart pound for you. My heart continues to pound each time I see you; each time I think of you. ℘ Because of you, I find poetry in everything. the love of an exceptional woman. Because of you, life is full of joy and I can’t wait to see how the rest of it unfolds. I will love you eternally. ℘ I love you with a bold love, fearless and strong. You empower me, pushing me to be all that I am. I know that you will help me to be the best husband I can be. I promise to love you fearlessly, powerfully and unconditionally always. ℘ Before I met you, my life was a puzzle with a missing piece. But you complete me, and marriage will be a beautiful picture of our love. I look forward to becoming your husband today. ℘ At this moment, it feels as if a lifetime of love is being poured into my heart. I promise to give you this love day by day and year by year as we grow old together. You are my perfect soul mate, the one my soul loves, my forever bride. I am nothing. You are the whole of me. Your love has perfectly completed me. I promise to love you with my whole being. ℘ The depth of a man’s love for a woman can never be fully expressed in words alone. So I vow to not only love you with words, but to also love you with time, laughter, tenderness and devotion. perfectly synchronized in faithful commitment for the rest or our lives. Today I become a blessed husband and you become a beautiful wife. As one we will build a home and a family. We will start meaningful traditions together, celebrating love always.